Standing Room Only | Critical End! Yes these still exist. And while I prefer stadium seating, it was surprisingly nostalgic to watch a film in an old sloped-floor theater like the heady days of my youth. Of course, I hate to admit that these days I’m most likely to skip the theater entirely in favor of my living room, which usually has far fewer tweens on their cell phones. Excluding my weekly iCarly parties. On a semi-related note, you’ll notice that the theater was advertising this week’s live Rifftrax event. 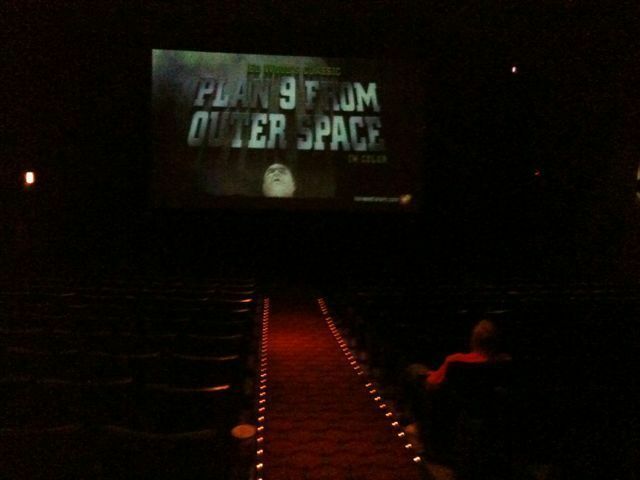 Three MST3K alumni goofing on Plan 9 From Outer Space, broadcast simultaneously to theaters across the country. We’re living in the not too distant future, kids. This entry was posted on Monday, August 17th, 2009 at 12:00 pmand is filed under . You can follow any responses to this entry through the RSS 2.0 feed. Both comments and pings are currently closed. Quentin’s top 20 since 1992 (since he’s been a director)… agreements? disagreements? Discuss. PS. Gotta go with us to see ‘Inglorious Basterds’ this weekend. A weird list, though not so weird for Tarantino. He lost me with the inclusion of Friday. I’m beginning to think I need to see Unbreakable again, but I’m not convinced I’ll like it any better since M Night himself admitted it’s only the first act of a movie. I do enjoy that even action junkie fanboy Tarantino can’t look at the Matrix the same anymore after the sequels. Also, I’m totally in for Inglorious Basterds.